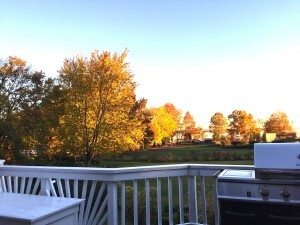 This was the view of autumn leaves from my deck this year. They were so beautiful! Now I have a lot of raking in my future. 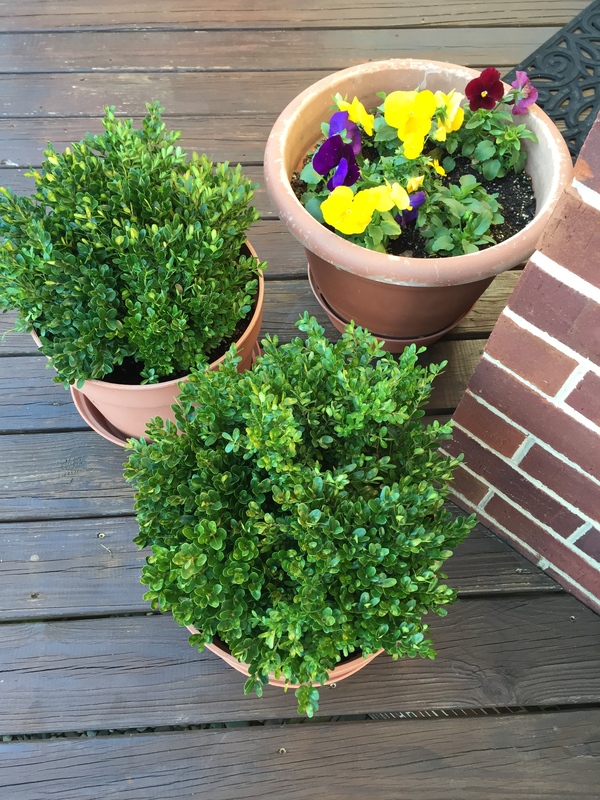 Now that the mums have finished blooming, I have filled in the pots with boxwood trimmings from my yard. They make beautiful “plants” all winter long. 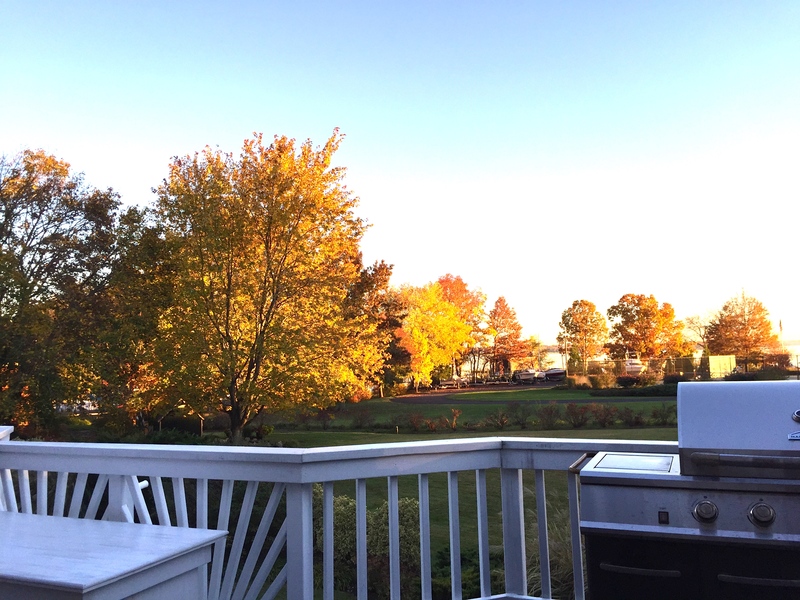 I’m finishing the last of the winterizing and want to share a few tips that will add polish to the holiday curb appeal, and make the perfect backdrop for seasonal decorations. These will make a big difference for just a weekend’s worth of effort. And as an added bonus, it’s also a great way to work off some of that turkey with all the trimmings that we love so much! First up is finishing the leaf raking and weed removal. 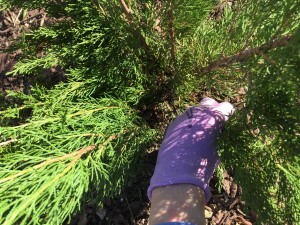 Reach in and pick out all the leaves that have gotten stuck in the bushes and then do a final pass in the mulched areas of the garden and your lawn. This alone will make a huge difference in the appearance, but we aren’t going to stop there! Next, give the mulch a rake to loosen it up, and add extra if needed. 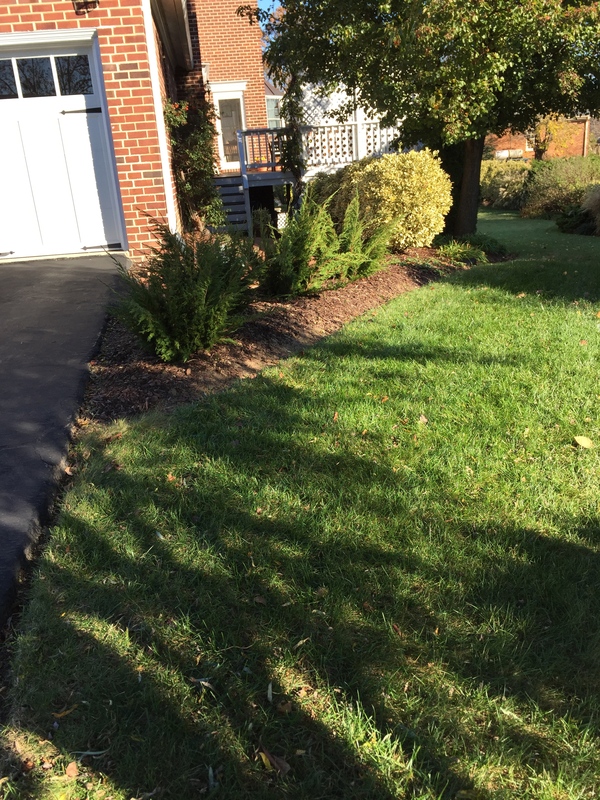 Winter mulch tip: As you are stirring up the mulch, make sure to leave a space of a few inches between the mulch and the wall of your home. This will discourage the unwanted “guests” (mice!) from burrowing there. 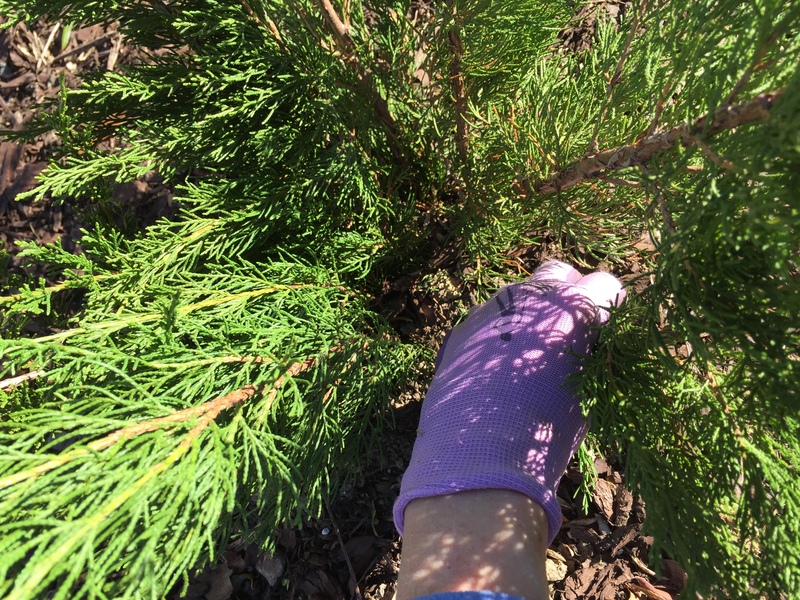 Fill in gaps in the garden by creating “instant plants,” just push small branches into the soil. Simple as that! Here is a row of “instant juniper” plants, where I removed the summer annuals. You’d never know they aren’t actually growing! Perfect time of the year to give the clay pots a good cleaning before storing them away for the winter months. Not all of the “instant” plants are used outside. 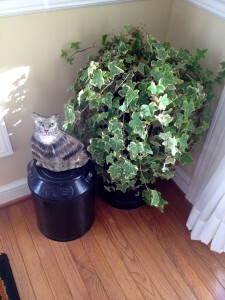 This extra ivy is in a bucket of water and will root over the winter. Ivy is also a good air filter, so I love to have some inside! Now that you have pulled out the spent summer flowers and have areas that might be looking a bit too spare, here’s one of my favorite tricks of the trade: I trim the bushes in the yard and use those trimmings to create “instant plants.” Just take the branches and push them into the soil about 6 to 8 inches. I use about a dozen small branches to create each “plant.” On either side of the driveway where I grow vinca in the summer, there are now juniper. They look great, you’d never know they weren’t actually growing. 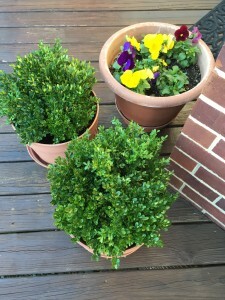 I also do this in the pots and window boxes to create small boxwood “plants.” This trick lasts for months, usually into February, and since I trimmed the branches from my own yard, its free! Speaking of planters and pots, this is the perfect time to give the clay pots a scrub and dry them in the sun before putting them away for the winter months. I like to use a scrub brush or a kitchen scrubbie with regular dish soap for this job. 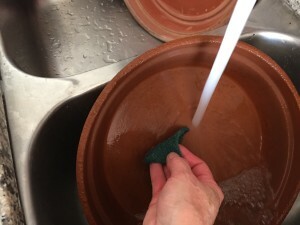 They easily get rid of the grime on the pots and make quick work of the job. Find a good place for winter storage where they won’t freeze. The clay can be very susceptible to cracking apart when it freezes. The same scrub is perfect for all the yard tools as well. A tip for the shovels and rakes: Once they have been cleaned, a light coating of cooking oil or spray will help guard against rust over the winter. The final crowning jewel to get your home ready is clean windows. Now that your yard looks so nice you will want to have fresh, sparkling windows to view all your hard work!